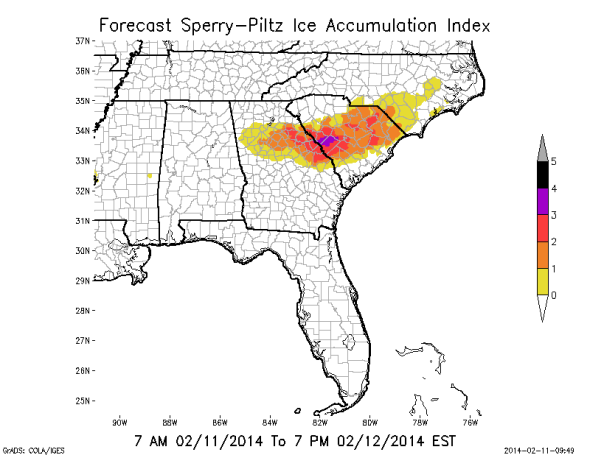 South snow/ice storm: National Weather Service says will be of "historic proportions." 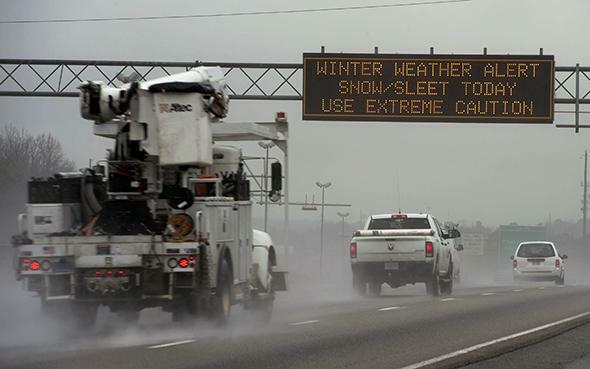 A travel advisory sign along I-85 South warns drivers of hazardous driving conditions as a winter storm approaches on February 11, 2014 in Atlanta, Georgia. In what could easily be confused for the opening lines of a new Stephen King book, the National Weather Service has quickly ratcheted up the language being used to describe the imminent ice-pocalypse descending on the Deep South. ​Lets just start by saying this winter storm may be of historic proportions for portions of the area. We are looking at significant snowfall totals north /especially northeast/ and significant…Crippling…Ice totals especially along the Interstate 20 corridor. The highest ice totals will be in a rough wedge generally from the metro Atlanta area and points east…South of I-85…And north of I-16. In other words, this is it. It’s been real, Atlanta. Walking Dead comparisons aside, it now seems like last month’s crippling storm was just a teaser for what’s to come. Those living down South aren’t the only lucky ones. Once the storm is finished laying to waste that swath of America formerly known as “the Carolinas,” it will grow into a classic nor’easter, with the potential for more than a foot of snow from D.C. to New England. A high societal impact winter storm is imminent across the srn tier of the country and very likely to proceed up the East Coast on Wed and Thurs … Basically extending from TX/LA to New England. A mammoth dome of surface arctic high pressure consumes the entire region. An impressive and dynamic [storm] impulse over the mid-Mississippi valley will glide along the jet stream and reach the northeast coast on Tuesday. 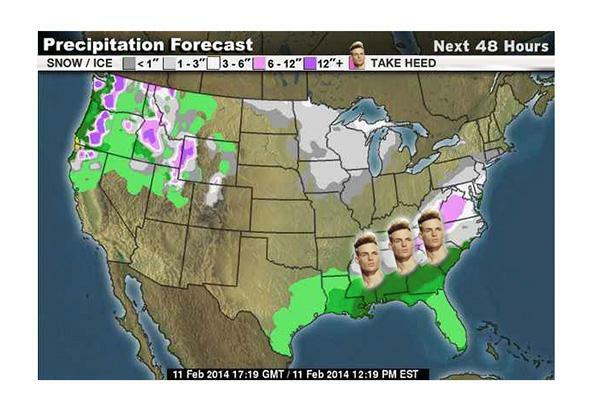 This will result in … the beginning of a paralyzing ice storm. The ice accumulations remain mind-boggling if not historical with additional .50 to 1 inch axis from Atlanta to Raleigh and 8 to 10 inches of snow from Asheville, North Carolina to just south of Washington, DC with a possible foot [in some spots]. After that, [models support] the beginning of a classic East Coast winter storm. The exact amounts on Thursday are still somewhat uncertain but a stripe of 6 to 12 inches will be potentially possible from Philadelphia through down east Maine. Why do they use these words? To sum up, a reasonable worst-case scenario could mean more than a foot of snowfall from the Georgia/South Carolina mountains to Washington, D.C., with potentially 8 to 12 inches across a broad swath from Philadelphia to New York City to Boston and New England. Yay, winter! Map by National Weather Service’s Weather Prediction Center. It is snowing where I live in Roswell [20 miles north of Atlanta]. My parents live 8 miles south of me in Sandy Springs and my mom is reporting “noisy rain.” My dad reports regular rain from a few more miles south in Atlanta. There is no bread at the grocery store as of last night. And when I stopped to get gas you could only get premium grade. The other two levels had “empty” post-it notes on them at every pump. To everyone on the East Coast who relished in a little schadenfreude during the last winter storm debacle in Atlanta, it seems this one’s coming for you, too.